One should know what exactly is the minimum increment in his Salary and revised allowances, if government approves the revised/enhanced. Although it may differ due to effective date of revised allowance from 01.01.2016 or 01.08.2016 or the month after the approval of report of allowances committee. Much awaited event for central government employees seems to furbish. It is assumed that the central government employees can't be left to feel disappointed with the final report of revised allowances recommended by the 7th Central Pay Commission that is going to be approved by the cabinet very soon. The Report, now being examined in the Department of Expenditure, will be placed before the Empowered Committee of Secretaries (E-CoS) set up to screen the 7th CPC recommendations and to firm up the proposal for approval of the Cabinet. Now moving to the most important point: One should know what exactly is the minimum increment in his Salary and revised allowances, if government approves the revised/enhanced. 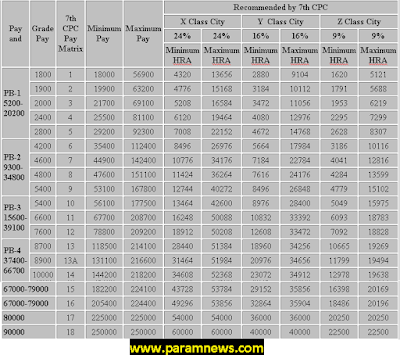 Although it may differ due to effective date of revised allowance from 01.01.2016 or 01.08.2016 or the month after the approval of report of allowances committee, but at the same time the paramnews.com team has analyzed report of revised allowances recommended by the 7th Central Pay Commission. The following bar graphs Table to show the allowances form a sizeable amount of the salary drawn by a government employee. The details of allowances recommended by 7th CPC. Empowered Committee of Secretaries (E-CoS) is now to Scan 7th CPC recommendations report submitted by Lavasa Committee, placing before the Cabinet Approval.